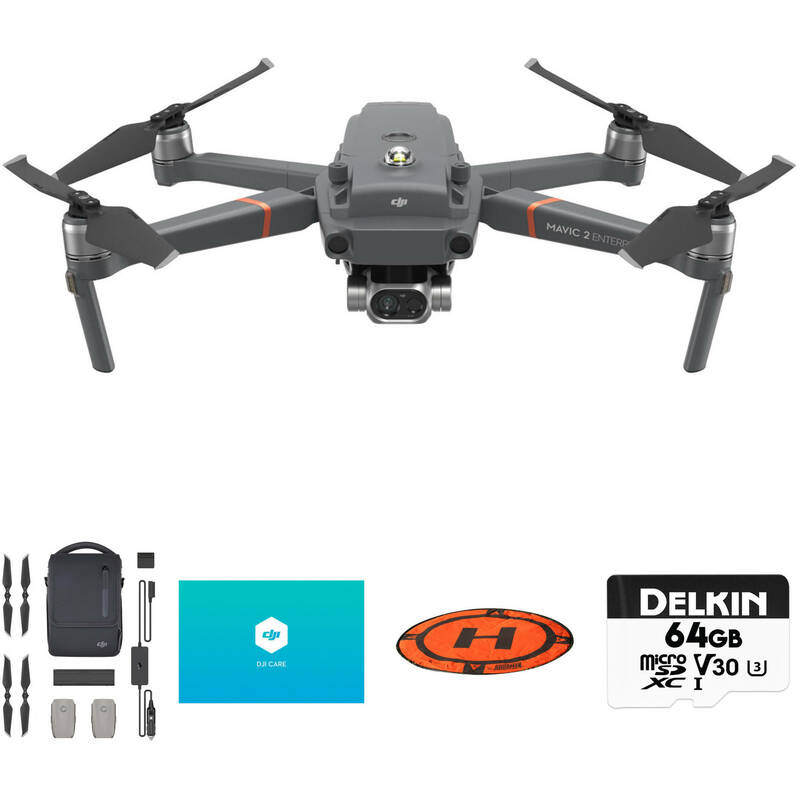 This Mavic 2 Enterprise Dual with Fly More Accessory Kit from B&H includes a DJI Mavic 2 Enterprise Dual quadcopter, a DJI Fly More kit, a landing pad, and SanDisk 64GB microSD card. 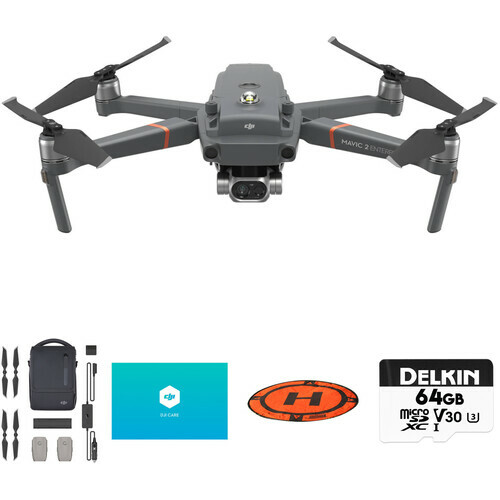 Together they provide you with an industrial-level drone and a host of accessories to both let you capture more footage and allow you to stay out in the field longer. The Mavic 2 Enterprise Dual is built upon the Mavic 2 flight platform, so it shares many of the same features as the Mavic 2, such as a 12MP sensor and the ability to capture up to UHD 4K resolution video at 30 fps. Unlike other Mavic 2 drones, the Enterprise Dual version is geared towards demanding industrial applications such as search and rescue, policing and firefighting, and inspections of vital infrastructures. To help with these tasks the Enterprise Dual includes three modular accessories: a spotlight, speaker, and beacon. The Mavic 2 Enterprise Dual can even function during the night or in poor visibility thanks to its built-in FLIR thermal sensor. To help get the Mavic 2 and all the bundled accessories on site, the Fly More kit includes a travel shoulder bag. The Fly More kit also includes some additional essential accessories including another set of replacement propeller blades, two self-heating flight batteries, and a power bank adapter. The adapter transforms a flight battery to a power bank, letting you use one to recharge other mobile devices. With the additional batteries you'll be able to stay in the air longer, which means you'll be able to take more footage. That's why this kit includes a 64GB SanDisk microSD card to join the already sizable 24GB of built-in Mavic 2 storage. The kit also includes a 29.5" landing pad to help give the Mavic 2 Enterprise Dual a clean surface for takeoffs and landings. This helps reduce debris that gets kicked up which could potentially damage the Mavic's gimbal. Built upon the Mavic 2 flight platform, the Mavic 2 Enterprise Dual from DJI is an advanced, enterprise-level drone solution for demanding applications. With the addition of a FLIR thermal imaging sensor, the Enterprise Dual can provide even greater capabilities during the night and in challenging daytime conditions. Whether you need an eye in the sky for search and rescue, policing and firefighting support, or for inspections of vital infrastructure, the Mavic 2 Enterprise Dual is designed to be a compact solution that's easily deployable. To help with these tasks, the Mavic 2 Enterprise Dual features a top extended port for mounting helpful modular accessories. You also get 24GB of onboard storage to capture all of the vital data you need when in the field. The Mavic 2 Enterprise Dual features a 24mm camera with a 1/2.3" 12MP sensor and FLIR thermal imaging sensor. 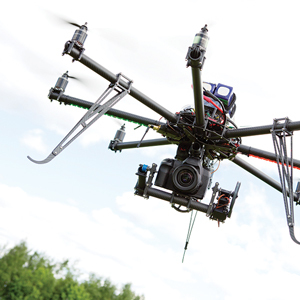 Together they can capture up to UHD 4K resolution video at 30 fps, or thermal imaging images and temperature data. The low-drag aerodynamic body design can achieve speeds of up to 44.7 mph, and the four-cell LiPo battery provides up to 31 minutes of flight time. The Mavic 2 Enterprise Dual also supports the same OcuSync 2.0 video transmission system. OcuSync 2.0 video transmission technology is engineered to provide a stable feed from up to 5 miles away in Full HD 1080p quality, letting you deal with situations in real time without having to be in harm's way. The Mavic 2 Enterprise Dual also features omnidirectional obstacle sensing and avoidance that can be crucial when navigating around sensitive equipment or in rapidly changing emergency scenarios. While navigating the ground, DJI AirSense is included to help avoid hazards in the air. 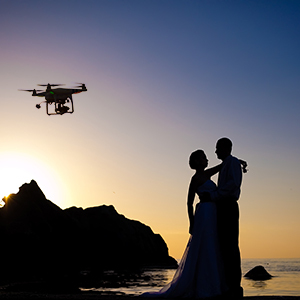 These and a myriad of other features help make for a dependable aerial solution to extend your data gathering capabilities. With the addition of a FLIR thermal sensor side-by-side with the 4K imaging sensor, you can utilize the Enterprise Dual in a variety of scenarios that the Mavic 2 Pro, Zoom, or Enterprise can't handle. The sensor lets you fly by heat signature, allowing for night flying and the avoidance of visual obstacles, such as smoke or fog. FLIR MSX: Combines data from both sensors in real time. This is designed to help enhance visual details and let pilots identify critical information that may have otherwise been invisible to the naked eye. Spot Meter: Shows the average temperature of an object. This is designed to help better locate hard-to-find targets, or stay clear of potentially hazardous substances. Area Measurement: Displays the average, lowest, and highest temperatures in an area and their corresponding locations. This is designed to help inspectors and other professionals on the ground to better assess their surroundings, and then quickly identify problem objects. Isotherm: This allows pilots to search for specific temperature ranges using a custom color palette, and gives you the option of creating custom profiles. The ability has the potential of helping groups, such as firefighters, to find hot spots or locate individuals for rescue. Enjoy peace of mind with the Enterprise Shield Basic Protection Plan for Mavic 2 Enterprise Dual from DJI. The Mavic 2 Enterprise Dual is not only a considerable investment, but it is likely an integral tool for your business or occupation that you can't be without for extended periods of time. This protection plan from DJI is designed to replace your Mavic 2 Enterprise Dual in case of accidental damage. DJI charges a fee per replacement and you get up to two replacements per year. The first replacement is $249, and $289 for the second. Each replacement is shipped free via local freight, and below are the types of damage that are covered by this plan. Please note that this covers everything except the Zenmuse X4S, X5S, or Z30 gimbal. A separate plan must be purchased to cover that. Box Dimensions (LxWxH) 17.9 x 15.3 x 9.2"
Mavic 2 Enterprise Dual with Fly More Accessory Kit is rated 5.0 out of 5 by 1. Rated 5 out of 5 by Alfredo from Great product! Everything was perfect and as specified! Can it take thermal imaging video ? What will be the resolution ? The thermal video recording mode in the camera is 640 x 360@8.7fps. DJI Mavic Enterprise is packaged in a pelican style hard case. Can I swap out the FLIR camera for the Hasselblad camera from the Pro version at a later point in time or is the FLIR camera built into the aircraft? No, the camera is built into the drone.